A search engine specialist explains why Google’s new live-updating search isn’t viable. Google engineers are famously encouraged to spend 20% of their work-day experimenting with pet-projects that interest them. The “20 percent time” has spawned a slew of popular services including Gmail and fun one-offs that end up in Google Labs. This week, the public got a sneak peek at Google’s newest experiment: streaming search. In a video leaked this week, search results are updated live, meaning with each letter typed in the search box, results automatically show up (“stream”) without having to click the search button. Essentially, this is a souped-up version of Google’s auto-complete feature, which provides users with search suggestions before finishing their queries (e.g., just typing “G” into Google will automatically suggest Gmail, Google, and Google Maps). While it’s exciting to watch the results seamlessly dissolve onto the page, some are skeptical of the service. Even Google has expressed restraint as to whether such technology would be implemented. “At any given time we are running between 50-200 search experiments,” said Gabriel Stricker, a Google spokesperson, of the live-updating search engine. In recent months, Google has been rolling out new features to its search engine, seemingly to slow rival Microsoft from gaining market share through Bing. Recently, Google added custom background images to its homepage, and it updated its search engine tools and rolled out a new image search. 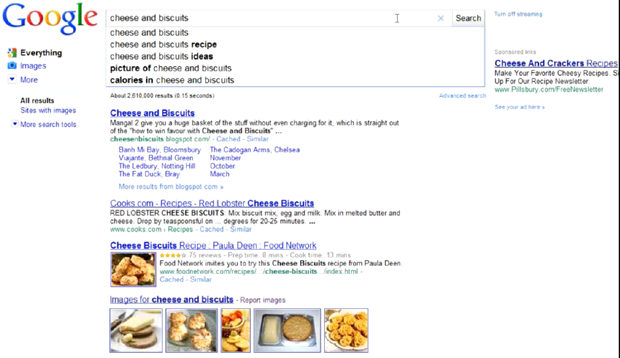 Many were quick to point out how similar these features were to Bing’s. However, as more features are rolled out, and search engines become more and more complicated, there is a sense that these experiments might be best kept to Google engineer’s spare 20% time, and never brought to the public. Is there a limit to search engine design?